Conferences and exhibitions are highly planned acts. Their success lies in the extent to which these are able to attain the aims they were arranged for within the given cost and time frame. To do this, a tracking system has to be in place. KPIs have often been called the SMART (Specific, Measurable, Actionable, Relevant and Time-Bound) parameters to gauge any task that involves an inter play of factors and they naturally find application in this domain. Financial aspect needs to be evaluated to make sure that the cost deadline is met. This can be done by assigning suitable values to indicators like, percent decrease in cost per attendee, Lodging: Total Cost Ratio, amount spent on publicity. Planning can be done by number of contingency plans, number of ways to spread information used and percent stretch possible in budget.Information Management and Scheduling Perspective can be obtained with number of ways to communicate, ways to register and number of information management sessions held. This covers the ancillary tasks to be completed.Brand Building can be achieved with number of known personalities hired, time spent in publicity and press release. Success at conferences is measured in various aspects, including financial measures. Impact of participation in a conference is measures too, for example by assessing referrals rate and new clients after the conference. Total number of speeches and average speech/presentation duration are other typical KPIs. Availability of information about registration and attendance is measured through assessment of such KPIs as ways to register, and publicity rate. Download trial version of Conference Performance Indicators. Purchase full version of Conference Performance Indicators + bonus. Conferences are official congregations arranged by organizations for displaying their products/ services or making some major announcements regarding their operations. At some other times, these discussions can take the shape of consultation meets that make it possible to exchange views and come up with solutions to pressing problems. However, the fact that these meetings have to be very structured and formatted in their proceedings makes it necessary for participants to have done sufficient back-ground work. The facts and statements should be well compiled and presented so as to make it visible to the listeners. These assemblies should be conducted in such a manner that the task gets over well within the time and cost frame. Successful winding up of the exhibitions therefore demands binding the involved aspects by a common thread. This invisible cord is often a 1990s concept called 'BSC' i.e. Balanced Scorecard. The utility lies in framing metrics and indicators that are suited to the performance gauging of the conference in practically any number of direction, the major ones being Financial, Planning, Information management and Brand Building. One can track the growth being experienced by comparing the actual and target values on regular basis. Related metrics and KPIs for: Web Investment, Brand Evaluation, Marketing, Direct Mail, Content Management, Trade Show, Word of Mouth Marketing, Exhibitions. Customers who viewed this item also viewed: Advertising Metrics. This is the actual scorecard with Conference Performance Indicators and performance indicators. 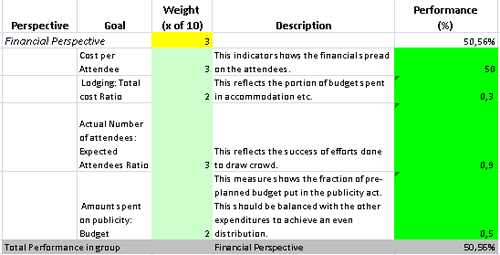 The performance indicators include: conference kpi, financial perspective, cost per attendee, lodging: total cost ratio, actual number of attendees: expected attendees ratio, amount spent on publicity: budget, planning perspective, number of back-up plans, space: people ratio, % extension possible in budget, number of informative-means shared, logistics perspective, number of ways to communicate, ways to register, ways to monitor schedule, number of means for entertainment, brand building perspective, number of known personalities hired, hours spent in publicity, % of attendees that participated in follow-up, time spent in press release. Download a trial version of Conference Estimation Balanced Scorecard or purchase a full version online. All articles about measuring performance in Marketing.